Railway Preservation News • View topic - B&LE 2-10-4 643 --- any news? B&LE 2-10-4 643 --- any news? Post subject: Re: B&LE 2-10-4 643 --- any news? I haven't heard any news in several months. You probably won't be hearing anything for several years. IIRC, the tubes were not changed on 643 in the 80s. The tubes are the same ones that the Bessemer put in before they retired the loco. People keep getting hung up on the tubes. The 1,472/15 is not about the tubes. It's about the inspection and UT of the boiler. In most cases, all or most of the tubes have to be removed to do that job properly. That's where people get the erroneous idea that the tubes have to be completely replaced. The same tubes, after inspection, can be re-ended and put back in if the owner wants to do that. However, when all costs are considered, many if not most owner operators choose to install new ones regardless of the condition of the old ones, simply because that is much faster and, depending on the source of labor (paid vs. volunteer) it is usually cheaper. performed on 643 in the '80s. That is the point I was trying to make Lincoln Penn, that no interior inspection was done. I think if there's a solid plan of operation, people behind it backing it making it work, a place to run with excursion cars...you'll go for the inspection. its not happenning as far as I can see. The last digest on this engine can be found here. It went on for 5 pages. B&LE 643 is where it is, doing what it's doing because it is such an enormous beast of a locomotive that any conceivable thought of operation is wildly overoptomistic and not based in fact. It would make a great museum static exhibit, as it did while preserved at Greenville by the railroad. Too bad it wasn't left there, otherwise it might be in better hands today. It's impossible to imagine an alternate history with any certainty, but it would seem that historic preservation might have been better served if the 3-engine Greenville collection had never been broken up. Having seen enough static locomotives slowly converting over to loco-shaped piles of rust, I wouldn't have bet on the engine being better off in a park. I was just thinking you could retire the blind driver with a thinner tire, or think about putting a flanged tire on it. The UP 4-12-2 originally had blind center tires but they tested it out and flanged them instead. Little River RR 110 4-6-2 has a blind center driver, it might not be a wider design but its running everywhere. your comment is overexxageration without positive imagination of what can be done. 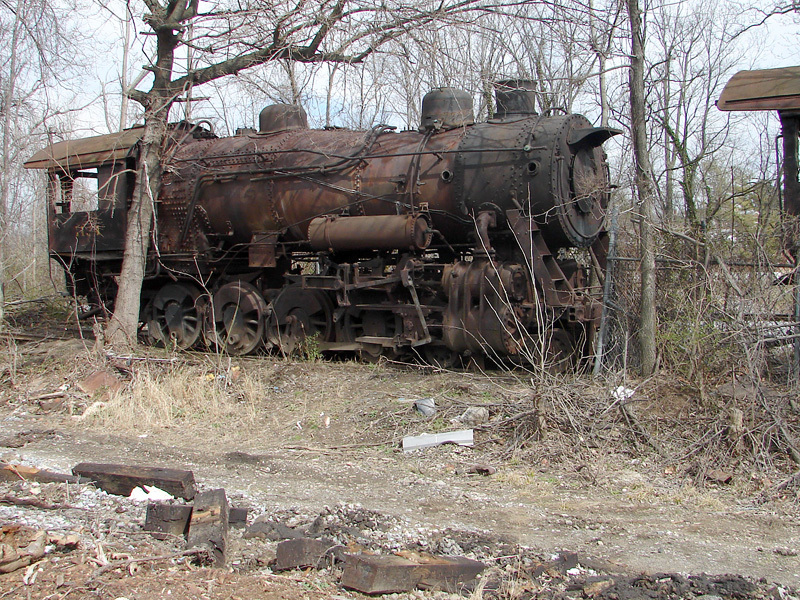 besides that, I believe any of the 4-8-0's could be fully restored to operation. First, who is this "you" of which thou speaketh????? That makes ALL the difference in the world. Give me the enthusiastic backing, budget, and blessings of a multi-billion-dollar corporation, and even I could get 643 moved and running. Second, "we" HAVEN'T "gotten a Big Boy going" yet. And there's now some serious, somewhat well-founded speculation as to whether the operative word should be "when" or "if." that arguement is repetitive what needs to be done for 643 and the solutions have already been spelled out tried/retried, its just reblowing the same hot air. Now we have 7 pages of the same lack of new relevant information being recycled on two threads at once. This one is a victim of lack of foresight and critical wishful thinking at the wrong time. The mass of critical problems to be solved to just get her where she can be dealt with is now overwhelming - not impossible, just beyond the means of all the most likely suspects, and requiring something akin to divine intervention to be solved. Until there's real news, let's shut up and let it go.